View More In Teakettles - Page 9. Enjoy exceptional coffee at home. This kettle is the best of the coffee world! This pour over kettle is made from premium surgical-grade stainless, with an easy-to-hold ergonomic handle that is also heat-resistant. The gooseneck spout allows for precise water flow that is perfect for making pour over coffee! The integrated temperature gauge allows you to brew at the optimal temperature (195-205°F). Make a perfect cup of coffee every time with our easy to read thermometer! A great gift for friends or family members. Dimension(D*K): 14.5 x 28 x 16cm/5.7"x 11"x6.3"
Built-in Thermometer: The integrated temperature gauge allows you to brew your coffee at the optimal temperature (195-205°F). 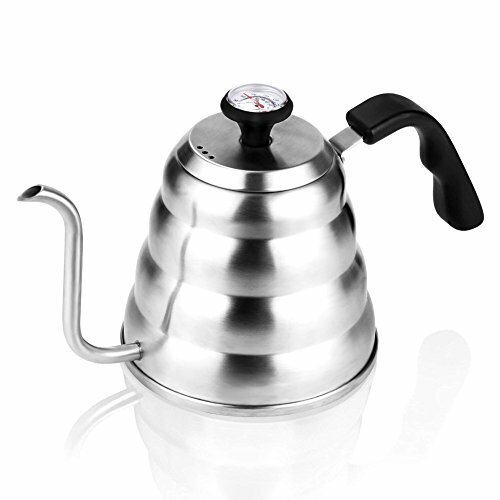 Make a perfect cup of coffee every time with our easy to read thermometer coffee kettle! Gooseneck Spout Kettle: Unique designed gooseneck slender spout for slow, steady and controlled pouring. Ergonomic Heat-Resistant Handle: Angled handle keeps hands away from the heated pot, ergonomically design for easy grip. Safe on All Stove Tops: Safe for use on gas, electric, halogen, and induction stovetops. If you have any questions about this product by ECPURCHASE, contact us by completing and submitting the form below. If you are looking for a specif part number, please include it with your message.